To put a little heat in your Oscar viewing, I've taken a classic Vodka Martini and put a little spice in it using pepper infused vodka. 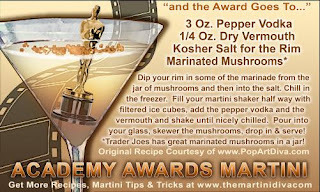 Instead of the traditional olive garnish I've used marinated mushrooms and added a salted rim for a little more seasoning on the Academy Awards. Maybe I'm hoping for a classic style Oscar show that has a little bit of pepper in it? I'm on the fence at this point about the hosts. Though I really like Anne Hathaway, I'm not that familiar with James Franco. The commercials both have participated in to promote the awards show this Sunday have seemed somewhat cute, but I tend to prefer a comic host who adds lots of laughter and tosses out in-jokes left and right, awards shows can be dull and slow paced without some decent entertainment sprinkled about. I'll give James Franco props for hosting the same year he's been nominated for Best Actor for 127 Hours, the stress that involves must be considerable! He has some great examples to follow as he is not the first nominated actor to host the Oscars. Seven times in the past nominated actors have hosted the Oscars, including Michael Caine who hosted in 1973 when he was up for Best Actor in Sleuth. Walter Matthau hosted in 1972 when he was nominated for Best Actor in Kotch and David Niven hosted the Oscars in 1958, the same year he won the Oscar for Best Actor in Separate Tables. 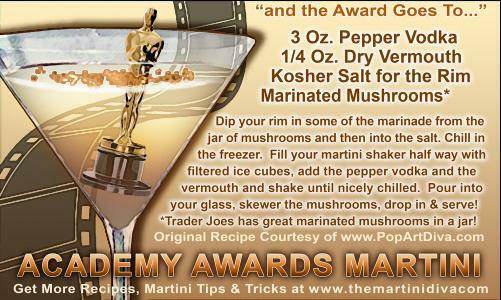 No matter how the Oscar show goes on Sunday, at least you enjoy some good eats with some of my TINY FOODS and have a great party by serving up any of my OSCAR COCKTAILS. I wish them both well and, if the commercials are any indication, we are at least going to enjoy some charm from these two hosts - but I'm still hoping for a streaker or two. . .